Printed from http://www.bodytalksystem.com//learn/news/article.cfm?id=913 on Apr 22, 2019. Gazing out over a beautiful Vancouver Island morning, pondering BodyTalk, I find myself on a wild ride of connections, pivotal moments and powerful aha's. Can you relate? It has been just over seven years since sitting down in a BodyTalk presentation in Victoria, BC, having no idea what this stuff was about and what was about to come. I remember walking down the hallway after the presentation, full of new ideas but not fully convinced, then an arm wrapping around my shoulder and the warmest voice saying "come for a session". That voice belonged to Bernadette, with us in spirit, back then a raving fan (and I'm sure she still is), brilliant practitioner of BodyTalk and all around beautiful person (and yes, I am tearing up at the moment remembering her). Her picture still sits just above my BodyTalk table, reminding me of that first time lying down on her table and the almost haunting recognition of the work she was doing and, of course, my subsequent and inevitable question, "How do I get started?" 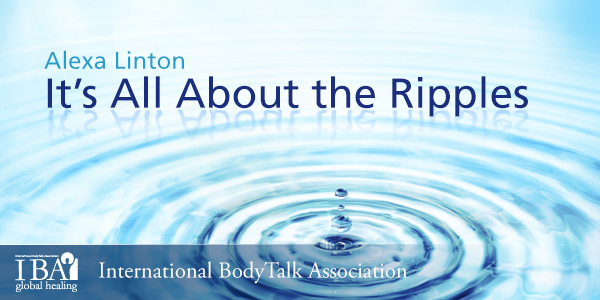 BodyTalk is all about the ripples. We talk in this work about waves, creating ripples in the body, in the mind, changing that which existed before. I see those ripples in my world, in the world of those that come to see me for sessions and instruction and those that I feel grateful to know and practice alongside. Before that very first presentation, a friend who knew me well, obviously very well, invited me strongly, in her unique assertive style, to check something new out. My gratitude for the push is indescribable. Next Bernadette, taking the time to mentor and challenge me on the table and off, I was certified within five months. Her passing rocked me, as it did the whole west coast matrix, bringing us closer in not only our grief but also in its resolution. There was confidence ripples with the integration of each new, fascinating module, with each client walking away changed. Clarity ripples with each session on myself, a growing, evolving self-love and empowerment spreading out into my world, shifting perspectives and unraveling stuck points inside and out. Connection ripples as friends and clients became practitioners and anchors, resources and inspiration and as clients spread the message of this powerful work through their new-found health, joy, and vitality. Count your ripples. I dare you. You may be there for hours, days, or for an eternity. They go on forever and each person that is practicing BodyTalk will find threads lacing back and down and sideways and all over the place. Clients, friends, family, colleagues, partners, animals, that guy you passed yesterday on the street and inspired just by being there. Am I right? My bet is that many of them you have no idea about, spreading far beyond your scope, carving a path with no effort on your part, just like our sessions are experienced in the body-mind, finding their own perfect way. There are times where you will feel isolated, confused, or stuck even. At those times, remember the ripples, that when you tap on someone, or they tap on you, something amazing happens that you can't even begin to fathom. This, right here, is one of the many reasons why I love BodyTalk. Is there anything cooler than a client getting up off your table, and ripple by ripple, their life has been changed irrevocably? I felt it, that very first session with Bernadette. My life changed, and I felt the ripples everywhere after not feeling much of anything for years.. in one session. From that one pivotal moment, I took every module, became an instructor, built a thriving practice, coordinated many courses, developed countless life changing relationships and referred thousands of people to this system. Can you imagine the effect of a thousand sessions? Or one hundred thousand? Take a moment to reach your mind out into our ever-growing matrix and ponder, feel into, the countless ripples. Feel them extending over the globe, touching lives, relationships, businesses and even governments. Each practitioner and client of BodyTalk adding strength and vitality, every matrix building exponentially as they connect and share their wisdom with the newest BodyTalkers and those who are ready to be inspired by this powerful work, even if they don't know it yet. I would love to hear what you experience when you connect in with this visual. The question that arises for me out of all of this is "How can I create more ripples?" Not only that, but how can they be stronger? If you are like me, someone who wants to create a lasting, positive effect on not only my clients, but also the world, then know that you have already begun. Every session you do, every step you take towards strengthening your practice and business, every session on you, every connection you create with a current practitioner, new student, or a potential one is building momentum and facilitating positive change. I invite you today to find one area where your ripple effect might be blocked or a little stuck and open your mind and heart to one action step to create more freedom. It might be getting a BodyTalk session for yourself, calling up a new practitioner and offering to answer questions or be a mentor, coordinating a course in your area, referring a friend or client, or even, if you are a new practitioner, doing a BodyTalk session for a family member or friend or reaching out to fellow practitioners. What action steps call out to you? Remember, ripples are easy to make. All you need to do is begin. Happy tapping. 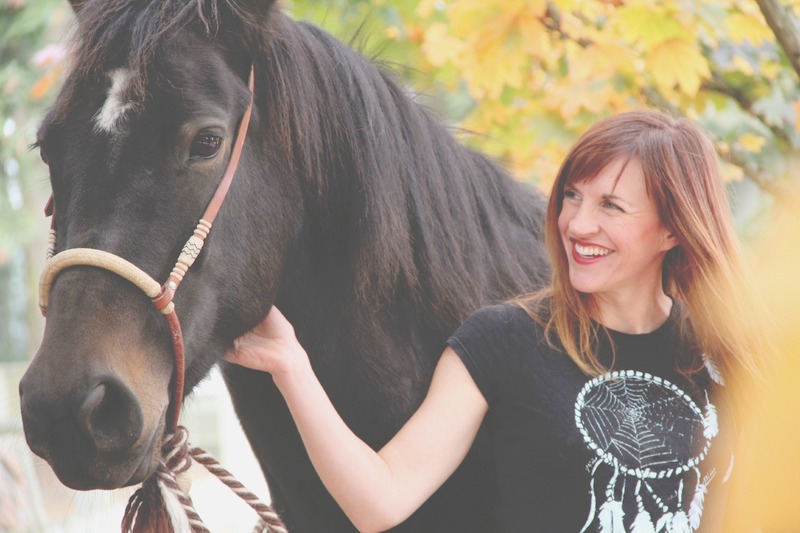 A modern day cowgirl with a mission, Alexa Linton is known for lighting up her world and her clients with her infectious personality, bold coaching style and her secret sauce, The BodyTalk System. When these forces combine, perceptions transform forever and health and lives shift into the next gear. 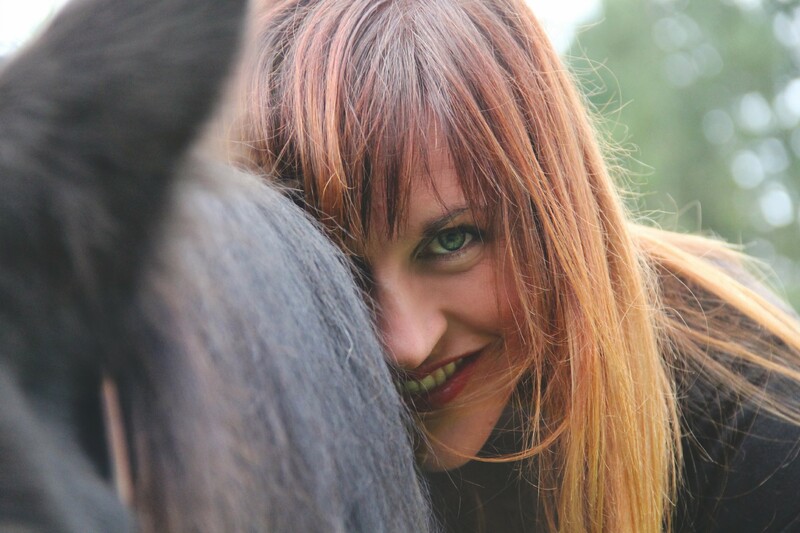 With over ten years of experience working with horses as an Equine Sport Therapist as well as thousands of animals and their owners, Alexa has developed a healing style that is as intuitive as it is inspiring. Her first and foremost priority is results and she has been a catalyst for positive and lasting change for thousands as a practitioner, teacher and writer. A fire-starter by nature, there is nothing Alexa loves more than seeing people light up from within and their lives change "magically" as a result. Well, that and animals. Alexa's animals are a part of the healing team, providing insight, giggles, massages and the effect of the perfect furry hot-water bottle. It is her big mission to help people find the fire in their relationships, career and bodies and truly live a life they love.